State Attorney informed hunger striking terrorist he will be released in November, against wishes of Internal Security Minister. Internal Security Minister Gilad Erdan (Likud) said Wednesday that he opposes the official offer made by the State Attorney's Office to hunger striking terrorist Mohammed Allan, to release him in November. 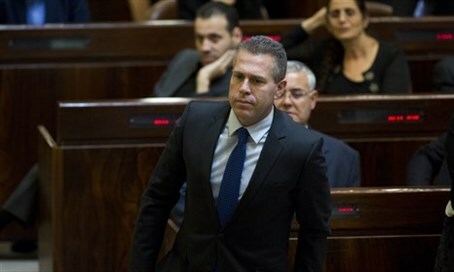 "His release will be a prize for the hunger strike he initiated and could cause a wave of mass hunger strikes among security prisoners, after they discover a new tool by means of which they can blackmail the state of Israel,” Erdan said. "One fights terrorism with determination and one does not seek compromises,” he added. The development raises questions regarding the degree to which Minister Erdan and Justice Minister Ayelet Shaked exercise control over their underlings, including the State Attorney's Office, which is considered a bastion of left-wing politics. Allan, 31, emerged from a coma on Tuesday afternoon, and pledged to resume fasting if Israel did not resolve his case within 24 hours. On Wednesday morning, his brother relayed that Allan intends to instruct doctors at Barzilai Hospital in Ashkelon to cease all treatment. "Today at 12, he will stop the feeding being given to him," Imad Allan told Army Radio. "He's not with us. Half of him is in a different world. Anyone who sees him would say on the spot 'release him, he's going to die.'" Barzilai Hospital confirmed that if Allan and his family requested to stop all treatment, doctors would not refuse. However, he also said that he assumes that if Allan is in life-threatening condition, he will be force-fed. "If he doesn't want treatment, he is responsible for his own actions and we won't take care of him," explained the hospital's director, Dr. Hezi Levy. "We are working according to Israeli law." Allan began his hunger strike 64 days ago, in protest against being held on administrative detention. A new law authorized the Israel Prison Service to force-feed him, though the doctors originally treating him in Soroka Hospital refused to do so, and the ones treating him now at Barzilai Hospital have not yet indicated they would do so either. He lost consciousness last week, leading to protests both against his treatment and against offering leniency to a terrorist.